as far as the eye can see…. Today was a long day of wide horizons and many miles. Although I’m not a sailor, I enjoy the expanse of desert and chaparral, the big dramatic sky. “And trashy men,” the man added. This same gentleman gave us an even more important tip. Lunch! After days of subsisting on nuts and dried fruit, we were all happy to be directed to something more substantial. 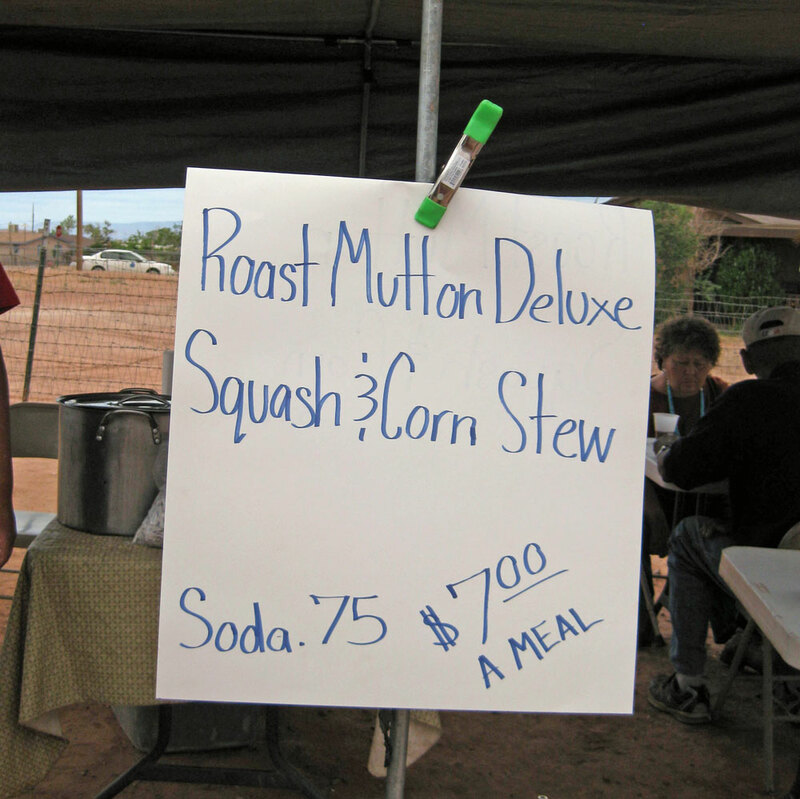 The promised “bar-b-q’d mutton was just around the corner from the gas station. The open market was like a garage sale with food vendors. Most of the venders were selling the same thing. 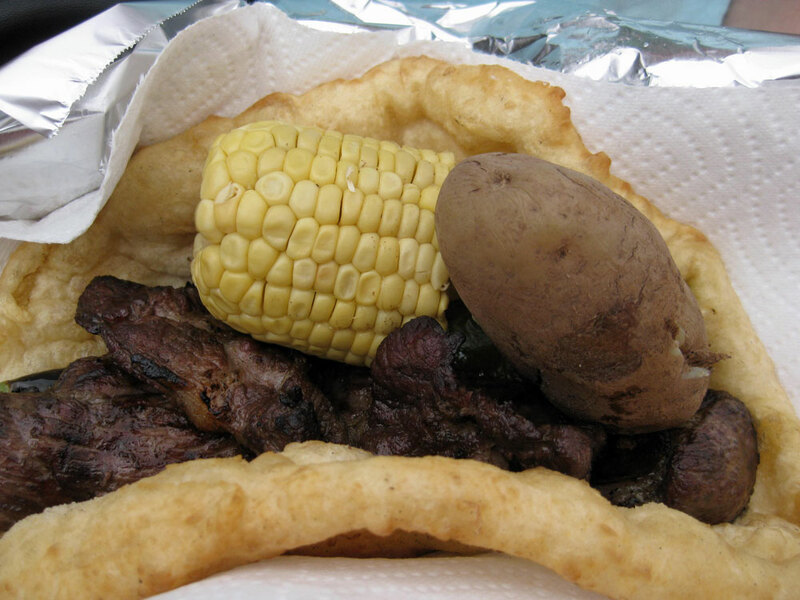 A mutton, corn and squash stew that was served with fry bread, or a “Mutton Deluxe” that consisted of an ear of corn, a baked potato, a roasted green chili and mutton on fry bread. It all tasted great! After Tuba City we headed to the Hopi Cultural Center. There was a collection of old photographs, artifacts and dioramas that were worth the trip. 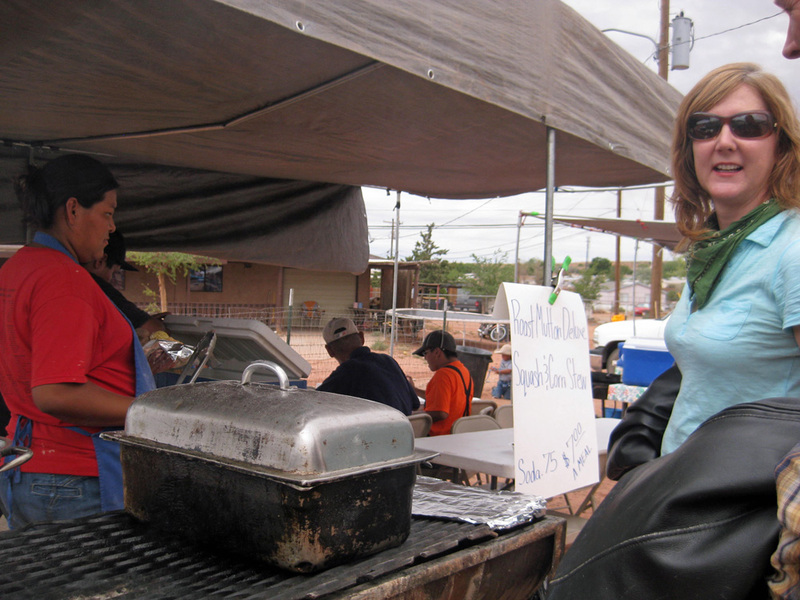 Outside there were vendors selling jewelry and kachinas. Here we caught up with the chase truck. From here we headed down highway 2 towards Leupp. In the distance, the storm clouds became more dramatic. It was difficult to tell if we were riding into a storm or not, but when I saw the red dust below the clouds, I figured the storm was headed towards us. 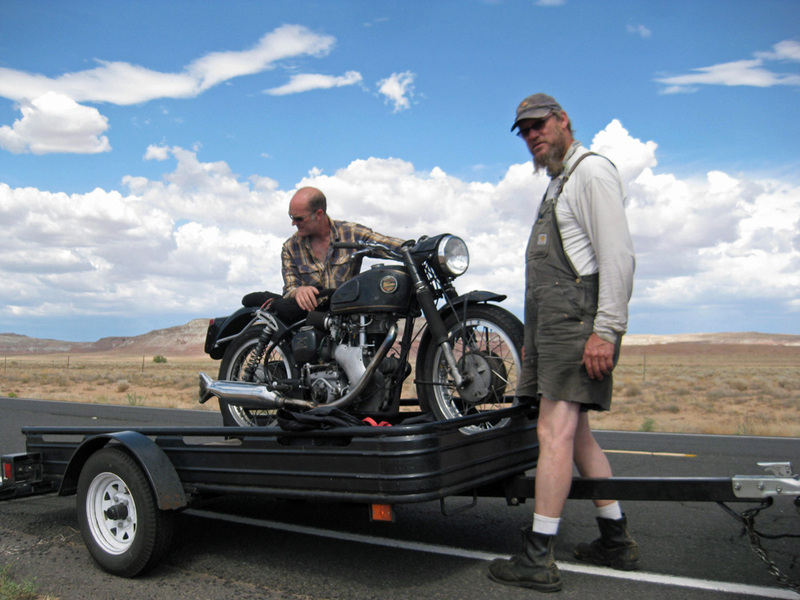 About a third of the way to Leupp, Jeff, who was in the lead, pulled over. Once again, his bike had just stopped working. He had fixed the problem with the float bowl, and now figured the problem was with the magneto. This is a fatal complaint. He knew the usual rules and didn’t want to keep the chase truck waiting so he loaded up his bike. Fred took off without waiting, and I departed next. There was a great sense of being alone on the road. Behind me, Jeff W turned down the offer of fuel from the chase truck and then ran out two miles from the station. On these open roads, my bike relaxed. It also seemed to like the fuel we were buying. This is not always true at home with lots of stop and go traffic. Once back at the camp, Paul d’Orleans added to the usual shenanigans by taking old time tintype photos. 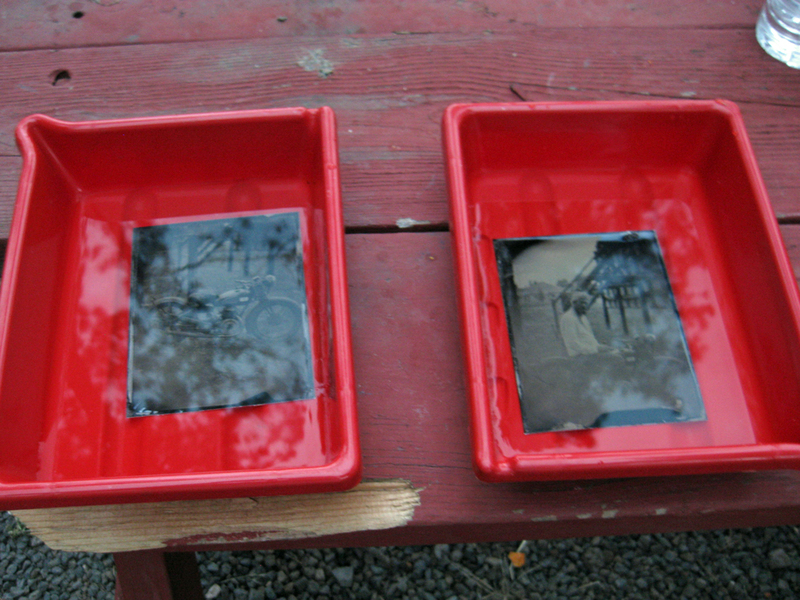 To see how these came out see Paul’s blog on tintypes in the desert, at his July 21. 2012 blog, the Vintagent. 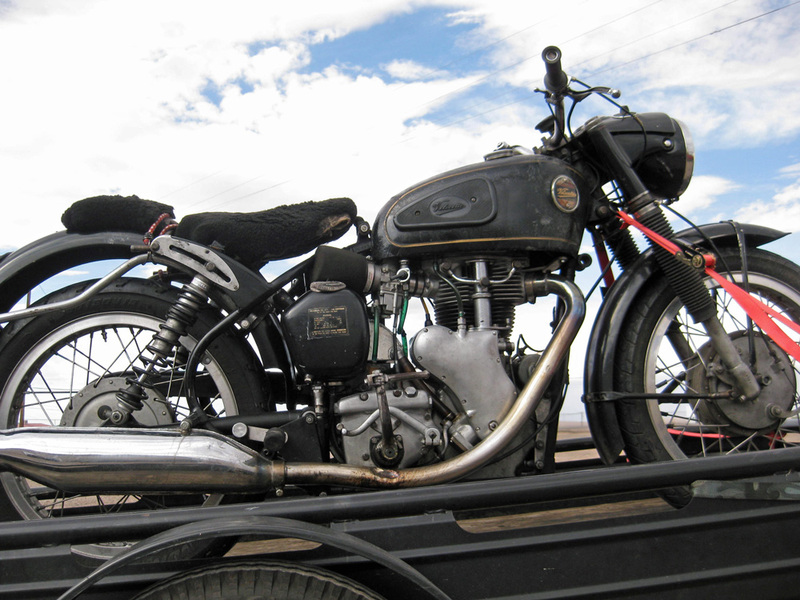 This entry was posted in Velocette & other British Motorcycles and tagged Lanora Cox, motorcycle rides, motorcycles, Velocette, vintage motorcycles, VOCNA. Bookmark the permalink.